InC - Lightning strikes twice! Shazam! 's new second trailer! Home / Everything Else: Article / Lightning strikes twice! Shazam! 's new second trailer! Lightning strikes twice! Shazam! 's new second trailer! At the moment, with the massive commercial (though not critical) success of Aquaman, the DC flag is flying high. Will the soon-to-be-released Shazam! complete the hat-trick of success that began with Wonder Woman for DC? From the two trailers of Shazam!, things look promising for DC. The premise of Shazam! - of a young kid who turns into an adult superhero by shouting "Shazam!" - is loaded chockfull of comic potential. And judging from the trailer, the movie is not wasting it. 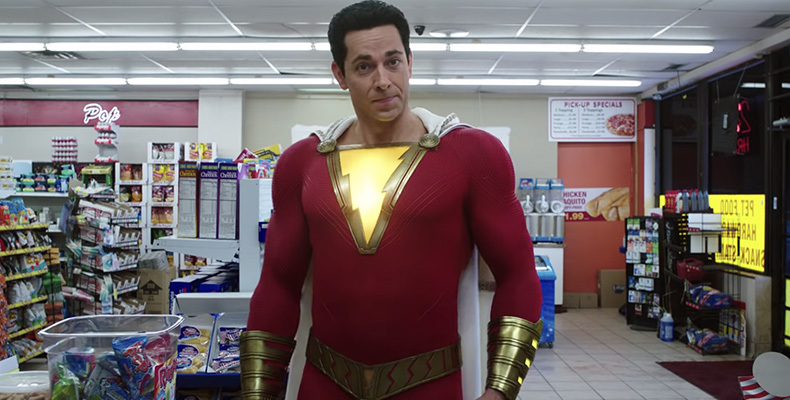 In the trailer, the best bit is when Shazam is in the convenience store trying to buy beer. While he looks like a grown man, Shazam is still a 14-year-old and his line, "I'd like to purchase some of your finest beer please! ", is hilarious. You can't blame us if we are looking forward to more of such comedy gold in the movie. Shazam! will be in cinemas on 4 April 2019.